Katie Hopkins is about as good a moral compass as you are likely to find. If she thinks something is bad it is without fail an unalloyed good, and vice versa. Her latest series of tweets suggests that she’s now gearing up to attack a Welsh language education, which is about the best recommendation our Welsh language schools could get. Her call for ‘information’ from the ‘parents of Wales’ about the language isn’t about getting at the truth, of course, but collecting ammunition for a propaganda drive against the language. This has been coming for a while. The far-right in the UK has seen in Brexit not just an opportunity to draw powers back from the EU (which Wales voted for) but to draw political, economic and cultural power back to London (which we didn’t). Hopkins’ efforts to disparage the Welsh language go hand in hand with UKIP’s efforts to abolish the Welsh Assembly, an institution Wales overwhelmingly voted to give more powers in 2011. The hatred towards all things Welsh by the British far-right is a curious thing. You would think that they would take pride in a language and culture native to these islands. The Welsh language was originally spoken as far afield as Edinburgh and the south of England. If anything has been Made in Britain™ it is the Welsh language. The truth is of course that the so-called ‘British’ nationalism of people like Katie Hopkins has nothing to do with celebrating actual British culture and all to do with creating a culture-less, uniform, authoritarian state that answers to a small elite of upper-class twits in the Home Counties. All criticism of Welsh language education ultimately rests on not understanding what it is, and Katie Hopkins’ tweets are no exception. First off, there is no such thing as ‘mandatory Welsh language education’ in Ceredigion. There are Welsh language schools and English-only schools here. Secondly, Welsh language education is a bilingual education – children who attend them are taught to speak both English and Welsh. 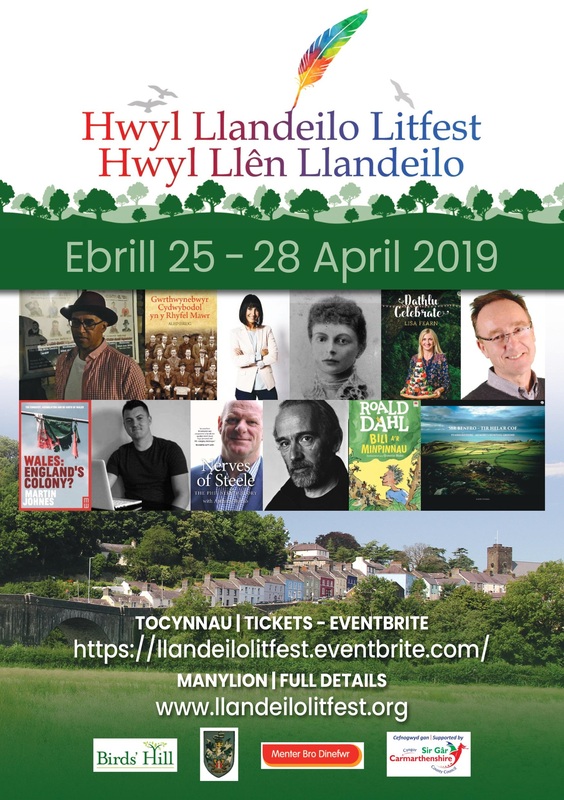 I and my partner had a Welsh language education, and my kids are now going to a Welsh language school, and we can all speak English as well as any first-language English speaker. So if English was ‘banned’ in Welsh schools, as Hopkins’ tweet claims, they would have to round everyone up, including the teachers, and the classroom would be empty. The question is why turn all of this down? 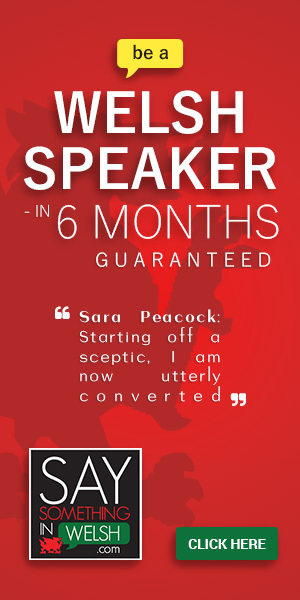 It is being freely offered to your child, at no extra cost, and no disadvantage to children at all. Hopkins asks ‘Has your child been impacted?’, and the only answer to that question is that, yes, they have been impacted, and the impact has been 100% positive. 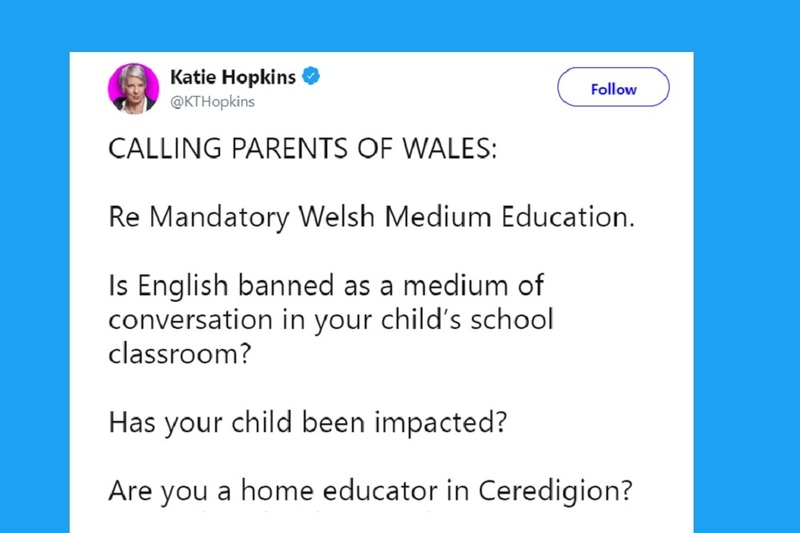 What Hopkins is fishing for of course is parents who will claim the opposite – that a Welsh language education has ‘held back’ a child, made it stupid, badly behaved and amoral. These were all accusations made towards the Welsh language back in the late 19th and early 20th century, before modern research and science showed them to be nonsense. So let us take pride in Welsh as one of the mosaic of languages making up the British Isles, which strengthens us and enriches our lives. And let’s reject those who, like Hopkins would like, seek only to foster spite and division by taking all that is good away from us.